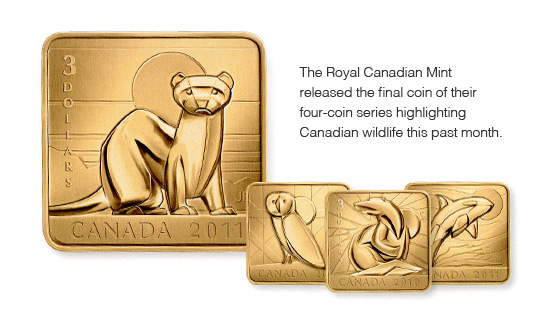 The Royal Canadian Mint release the final coin of their four-coin series highlighting Canadian wildlife this past month. The Royal Canadian Mint’s newest coin depicts the black footed ferret. Like the other coins in this series, the wildlife artwork was created by Jason Bouwman of Compass Creative Studio in Burlington. The series began in 2010 with coins featuring a polar bear and barn owl, and earlier this year the orca whale coin was released. All four animals are considered Species at Risk in Canada. The black footed ferret is a prairie animal thought to have been extinct for decades until a small population was discovered in the 1980s. With the help of species recovery programs since then, ferret populations have been bred in captivity and re-introduced into their natural habitats in Canada, US and Mexico. Their numbers are still very few, but, thankfully, growing. The Mint has received worldwide recognition for its innovative designs and minting technology, and the new wildlife coin series exemplifies this – the sterling silver gold-plated $3 coins are square in shape. Jason Bouwman has been commissioned by the Mint for several coins in the past few years, both for collector pieces and coins for circulation. For further information on mintages and availability, contact the Royal Canadian Mint.